Should most redevelopment be in activity centres? I noted yesterday that Melbourne @ 5 Million envisages just over half of all new dwellings constructed between now and 2030 – about 16,000 per year – will be located within the built-up area. The rest will be built in the fringe Growth Areas. 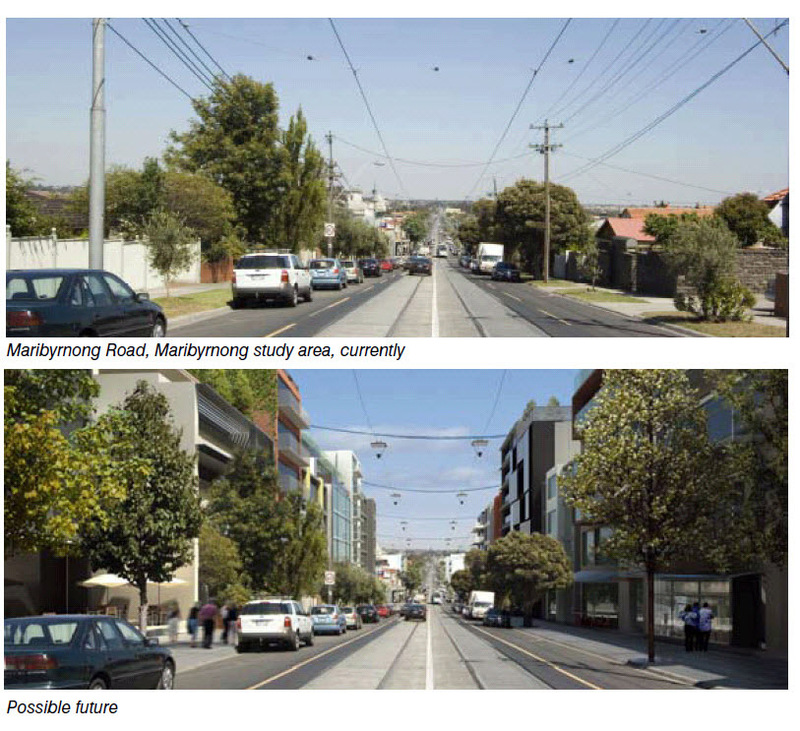 This is a significant reduction compared to the 69% share Melbourne 2030 envisaged would be built within established areas over 2001 to 2030. My view is that the disadvantages of sprawl are routinely exaggerated and the fringe will necessarily be an important location for some of the expected future growth. But I think home buyers’ preference for the outer suburbs is also commonly exaggerated. I expect many fringe settlers would prefer a location closer to the centre if only the market could deliver a better space/price compromise. I think one of the reasons they can’t find that compromise could be the Government’s policy of prioritising redevelopment to strategic locations, like activity centres and along main transport routes. According to Melbourne @ 5 Million, the focus of growth within the established suburbs is on “locating more intense housing development in and around activity centres, along tram routes and the orbital bus routes on the Principal Public Transport Network, in areas close to train stations and on large redevelopment sites”. Assessing the success of this approach with publicly available data is hard. The strategy seems to work in the inner city, but that region only accounted for 18% of all dwelling approvals within the inner and middle suburbs in the year to March 31, 2010. One piece of suggestive evidence is the 2009 Annual Report of the Urban Development Program. It shows that only four of the 26 designated Principal Activity Centres (including CADs) had more than 100 dwelling units under construction in projects with ten or more units (the largest was Coburg, with about 700). Putting the main focus on a relatively small part of Melbourne means that most new development will inevitably be at high densities. Transforming Melbourne, for example, proposes that all of Melbourne’s future growth could be accommodated on just 3% of the area within the Urban Growth Boundary, primarily along bus routes. It proposes densities of between 90 and 400 persons per hectare. However as I’ve pointed out before, it costs $100,000 more to build a small two bedroom apartment in a five storey or higher development than it does to provide a three bedroom house with a garden on the fringe. Notwithstanding this premium, apartments are preferred by certain demographics who value accessibility to the city centre very highly, principally young, one and two person households. But it won’t attract the sorts of households who are currently settling on the fringe. They want much more space for a family, access to a garden and they eschew the noise, pollution and congestion associated with development along main roads. I expect they would be prepared to make some compromises for a more central location in (say) the middle suburbs, but a premium of $100,000 simply slams the door. I can see why the Government favours this approach. It ostensibly means that residents of these new developments will use public transport instead of cars. Government outlays will be lower because of spare capacity in existing infrastructure. I’m sure it also hasn’t escaped the attention of politicians that it helps defuse political opposition to redevelopment within predominantly residential precincts. But as I’ve pointed out before, the first two advantages are by no means certain. The likely mode shift arising from such developments is not high – increased traffic congestion is a more likely outcome. Spare infrastructure capacity is in many cases almost certainly a myth. In fact it is likely to cost more to provide additional infrastructure capacity in established areas than it does in the suburbs. The introduction of policies to charge the full cost of car travel would make apartments on strategic sites more attractive relative to the fringe, but it’s not going to overcome the demographic mis-match or the price premium. Activity centres and major transport routes will nevertheless have a role in meeting Melbourne’s future housing needs, especially in areas close to the city centre, provided issues like land assembly can be addressed satisfactorily. But if a larger proportion of the households who currently settle in the Growth Areas is to be attracted to locations within the established suburbs, then other options need to be considered. I’d like to suggest the option of putting more effort into facilitating redevelopment opportunities in older residential suburbs with larger lots. Some, like Montmorency, even have lots that literally are “quarter acre blocks”. The advantage is that land assembly is easier, there aren’t competing commercial uses and the value of existing buildings is likely on average to be lower. The kind of development appropriate to these areas would be small scale, two storey town house projects that can reap some of the efficiencies associated with our efficient cottage building industry, while providing residents with a small garden and attached garage. They are likely to be more attractive to developers in neighbourhoods where the value of existing buildings is not high i.e. areas that have not been gentrified. The fact that many of these opportunities are not in areas that are within walking distance of rail lines or activity centres should not be a show-stopper. They should instead be supported by policies to speed up the transition to energy efficient, low emission cars. The expanding population should also help support bus services that give better connection to the Principal Public Transport Network. This approach is not going to provide the sort of urban-romantic, European streetscapes envisaged in Transforming Melbourne. Nor is it going to create buzzy, high density, mixed use activity centres. But it would give more people the option of living closer to the centre and it might improve the quality of their lives, defined on their terms.